We use standard equipment for laparoscopy, including high-flow insufflator, xenon-light source, three-chip charge compled device camera, and a high-frequency generator for mono- and bipoar coagulation. A voice-controlled robot is utilized to maneuver the telescope (Table 2). A rectal balloon is used for rectal identifications. The retracting forceps are kept in place by a mechanical articulated arm (Martin arm). The main parts of the operation are carried out by use of a bipolar forceps and Metzenbaum endoscissors. 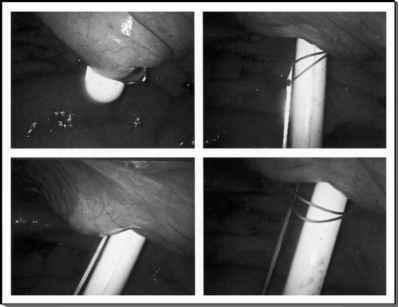 Endoscopic suturing is performed with a fine needle holder providing a scissors-like handle. A special endo-peanut-sponge holder is used for bladder retraction. For vascular control, we use 10-mm clip-applicator, and for nerve-sparing technique, we use a 5-mm clip-applicator. We also use an applier for placement of lockable polyurethane clips (Hem-O-Lok). For the urethral stump, we use a special designed open tip 20-French bougie.